The African sun is HOT! And in the rainy season, the rains come unannounced. It was obvious that we needed a place to hold our church services and our classes out of the elements. So we began. The foundations for the pillars were dug and rebar cages were built to lend support to the pillars which will hold up the roof. It was originally planned that we would include a loft to house short term mission teams while they were in the village. But the extra construction challenges of doing this were deemed too costly and difficult. So a separate hut will be built to house the teams. A builder has been hired. The bricks have been ordered from a brick maker in Hwenge. We are waiting for word that they are ready to pick up. At that point, the construction of this building will continue. Three sides of the structure will be open above short walls that can be used for extra seating. The fourth wall will be solid. This wall will be used to hold up screens or blackboards which can be used for classes. There will be a storage shed on the outside of that wall to store chairs and other supplies when not in use. The open sides will have roll down tarps to block sun, wind and rain when needed. The open sides will allow light and air movement into the building. A thatched roof will provide insulation against the hot sun. This building will be an asset to the mission and to the community. It can be utilized for Bible studies and church, training classes, workshops, work space for co-ops. The community will be able to use it for community meetings, weddings, funerals and other events. While we are waiting for the construction to resume, we have not been idle. 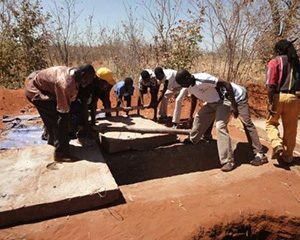 We have built a toilet building for the use of the church. This toilet was also built to provide biogas. The community has been quite interested in how it works. 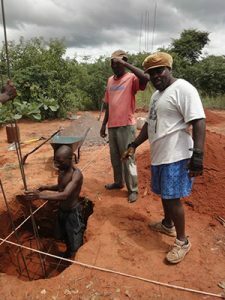 We are currently constructing a two stall solar shower building to be used by mission teams when they stay in the village. The next small structure to be built will be a hut to house mission teams.